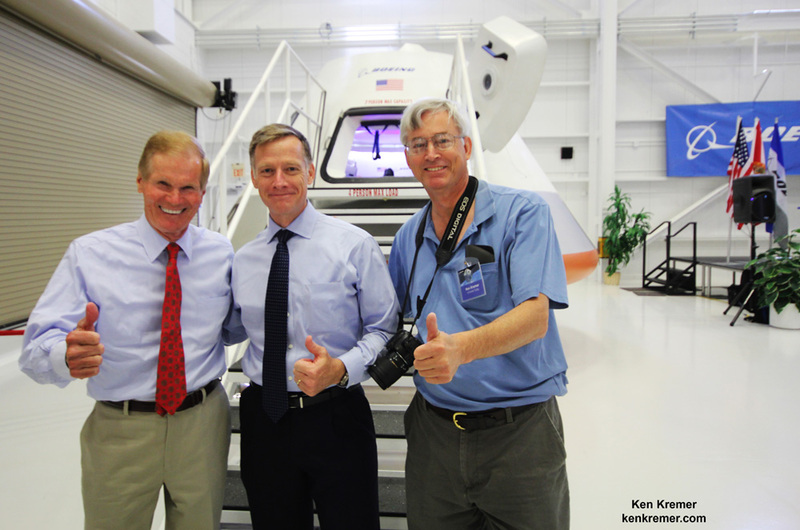 KENNEDY SPACE CENTER, FL – In the ‘new race to space’ to restore our ability to launch Americans to orbit from American soil with an American-built commercial ‘space taxi’, Boeing recently unveiled a full-scale mockup of their CST-100 spaceship at an invitation only ceremony for Boeing executives and media. I was invited to attend the event, which was held at the Kennedy Space Center in Florida, for a tour and first hand inspection of the CST-100’s capsule’s interior and exterior. My tour took place inside the newly renovated shuttle era facility where the capsule would start being manufactured later this year. The refurbished processing hangar was known during the shuttle era as Orbiter Processing Facility-3 (OPF-3). The CST-100 is a privately built, man-rated capsule being developed with funding from NASA under the auspices of the agency’s Commercial Crew Program (CCP) in a public/private partnership between NASA and industry. Boeing is one of three American aerospace firms vying for a NASA contract to build a ‘space taxi’ to ferry US astronauts to the space station and back as soon as 2017. The SpaceX Dragon V2 and Sierra Nevada Dream Chaser are also receiving funds from NASA’s commercial crew program. NASA will soon award one or more contracts to build America’s next human rated spaceship sometime in September. Since the shutdown of NASA’s shuttle program in 2011, US astronauts have been 100% dependent on the Russians for rides to the station and back at a cost exceeding $70 million per seat. The vehicle includes five recliner seats, a hatch with a window, the pilot’s control console with Samsung tablets for the crew to access wireless internet and an ISS docking port. It also features Boeing’s LED Sky Lighting adapted from its 787 Dreamliner airplanes. It will launch atop a United Launch Alliance (ULA) Atlas V rocket. Read more about the CST-100 in my Universe Today articles and exclusive, one-on-one interviews with Chris Ferguson, NASA’s final space shuttle commander for the STS-135 mission. He now serves as director of Boeing’s Crew and Mission Operations. Antares Rocket Launch to ISS, mid-Oct: NASA Wallops Island, VA. Evening outreach at Rodeway Inn, Chincoteague, VA. 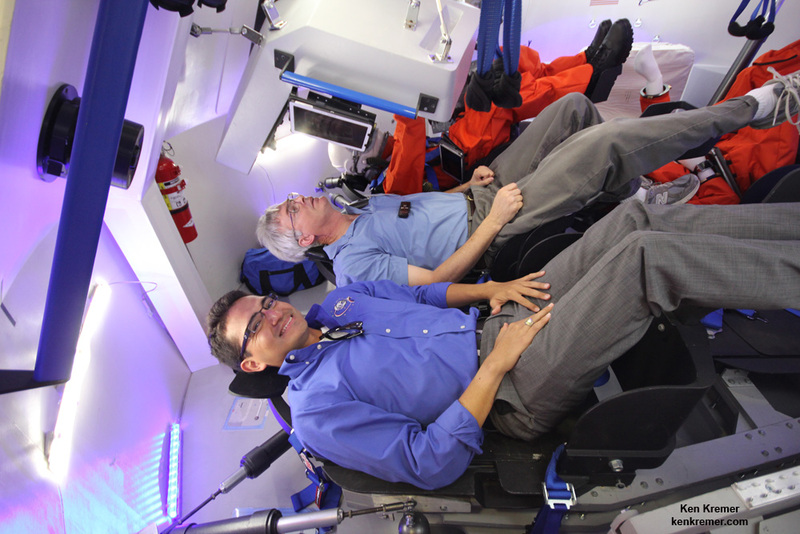 The Future of NASA’s Human Spaceflight Program: AAAP, Princeton University, Fall 2014. This entry was posted in September 2014, Sidereal Times and tagged boeing, kremer, space taxi. Bookmark the permalink.